During his professional career, Giovanni Battaglin participated in the Giro d'Italia 10 times, the Tour of Switzerland 6 times, the Tour de France 5 times, the Vuelta a España once and the World Championships 8 times. In 1981, Giovanni won the Vuelta and Giro d'Italia consecutively; a feat only very few cyclist were able to accomplish. After many years of research and development we are proud to present our latest series of race bikes. Our monocoque carbon frames technology allows us to push the limits of composite technology to build the strongest and lightest frames available anywhere. At the top of our road line is the 900gram C13 EVO and 950gram C14 PRO frame. Developed by Giovanni Battaglin in conjunction with the Zalf Fior team, the C13 Evo features a full carbon fiber fork with an integrated seat mast for the C13 and an tradition seat post for the C14. Our monocoque frames push the limits of what is possible in frame manufacturing. All of our frames use proprietary features to optimize weight and stiffness for greater acceleration, efficiency and handling. The strategically designed head tube and steerer assembling increases strength and stiffness by tapering an 1 1/8" on the top to 1 1/2" on the crown. This increases strength and stiffness for greater steering precision. Our attention to the smallest detail makes our bikes faster and more responsive and helped pro riders to the podium of the most important races around the world. The C13 EVO and the C14 PRO is a dream come true for any cyclist seeking top performance. These super lightweight carbon frames use the same materials and fabrication as in the aerospace industry. Battaglin's precision frame geometry combined with the use of high end materials has created a frame perfectly balanced in dimensions and handling. The carbon fiber monocoque fork gives the rider comfort and rigidity. Design features include an integrated seat post on the C13 EVO and a BB30 bottom bracket for more rigidity. An ideal racing frame, suited for every rider who demands the most from their equipment on every ride. Our road line also includes the C12 and our TT frame. These two frames round up our road line with the 970gram C12 frame and the revolutionary TT frame TCR. Every bike is 100% handmade in Italy by a selected team of experienced engineers. Giovanni Battaglin has designed and produced high-performance racing bikes since the early 1980s and is today one of the most recognized and oldest independent bicycle manufacturer in the world. 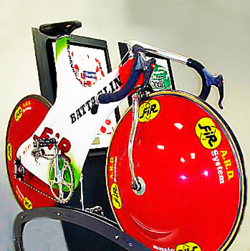 Battaglin Cycles products emerge from research, systematic checks at all stages of processing, and road tests. Technical performance, a fundamental value to Battaglin, ensures quality and dependability that are characteristic of their tradition. Today the Battaglin family remains true to their reputation in every phase of manufacturing and sales. Each department is continually evolving in order to provide quality products and services. Many days Giovanni himself is busy welcoming clients and assisting them with their needs. The family has never forgotten the lessons of tradition and is constantly on the watch for opportunities to undertake and develop with new technological and marketing projects. Fukushima 131 The Fukushima 131 is a bike we recently auctioned to benefit the families in Japan: In partnership with designer Marco Chiurato we developed Fukushima 131. This unique bicycle is on display in Milan and will be auctioned off to raise money for the people in Japan. The red circle at the bottom represents the Japanese flag but also the devastated territory and the suffering of a people struck by the tsunami.